Who else is ready to throw months of data and research out the window and make some sweeping declarations with less than 2 percent of 2019 action firmly in the books! Let’s jettison old closers and anoint new ones! I kid of course, but there already has been a fair amount of news on the closer front. So here is a look at some of the early goings on around the league and takeaways to see what we can glean from this small sample size going forward. 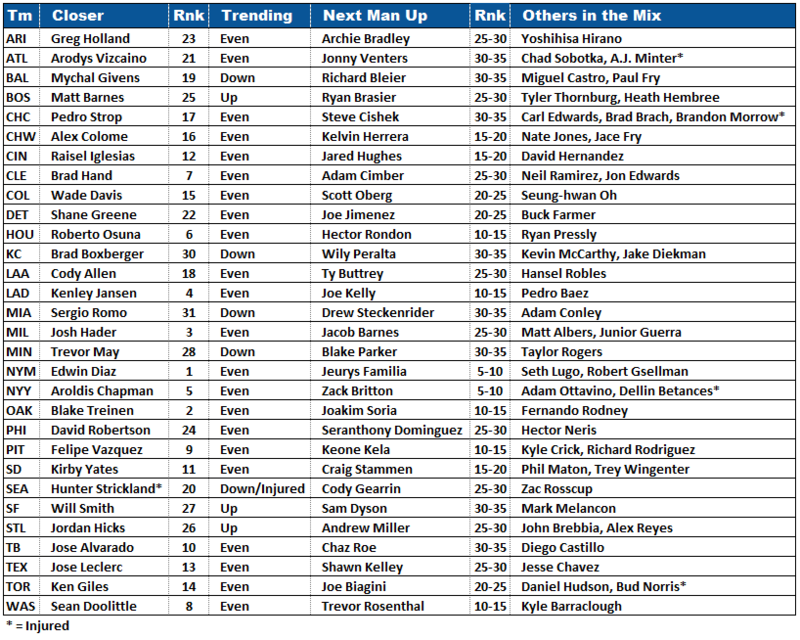 Below is my updated bullpen report, featuring closer rankings and depth charts. Below is a chart with a quick synopsis of each team’s current closer situation. I have listed each team’s closer (or at least who I believe their current closer is) and their ranking. Please note that I have not changed my rankings from last week’s piece. Despite my instincts to push the panic button, I am choosing to let things breathe a little before I make any drastic changes. After the closer rankings you will see the pitcher who appears to be next in line and another ranking. This is the ranking that said pitcher would likely be given in the event he becomes the closer. It is basically my assessment of what the falloff would be from the team’s current closer to their next in line. For example, Josh Hader is my number-three closer. But if his arm fell off tomorrow, Jacob Barnes would not be my number-three closer. Far from it. 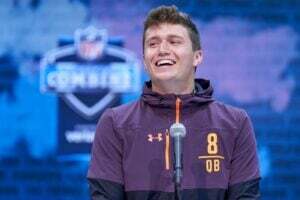 He would likely wind up as part of an uninspiring committee and rank outside my top-20. But if Aroldis Chapman or Felipe Vazquez were to go down, I think their teams would be fine with their secondary options. I have also listed one or two additional options for each team. These are pitchers who may currently be injured or who are a bit lower on the totem pole but could be given the opportunity to close down the road. 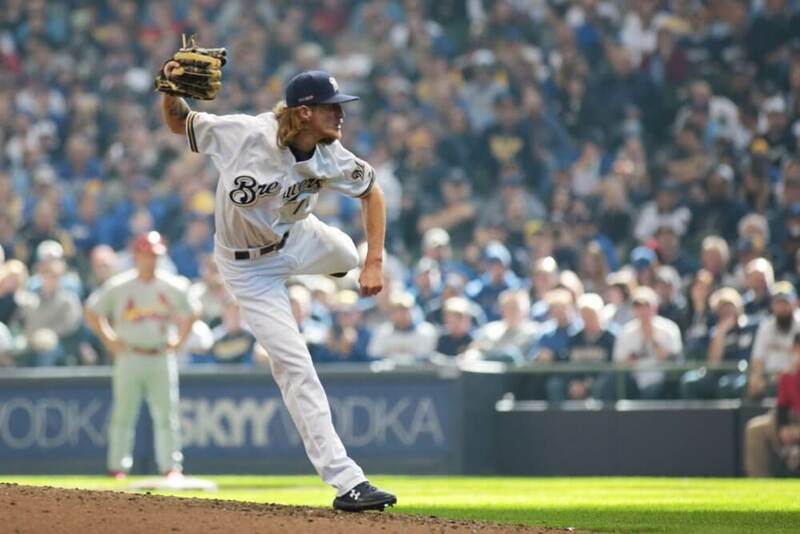 Before the season, I ranked Josh Hader higher than anyone I have seen. Hader got an Opening Day save by pitching two perfect innings with four strikeouts against the Cardinals. Shoutout to Lorenzo Cain for that game-saving catch. Hader followed up by pitching an immaculate inning, throwing nine pitches to record three strikeouts. Hader has faced nine hitters so far this season and retired them all, seven via strikeout. He has thrown 30 pitches, all fastballs, and registered a 60 percent swinging strike rate. Corey Knebel confirmed on Friday that he will undergo Tommy John surgery, ending his season. Hader now has a much clearer path to saving 30+ games this year. He will also provide solid ratios and a ton of punchouts. If you bought in, enjoy the ride. Raisel Iglesias was used in the dreaded high-leverage role on Opening Day, also entering the game to start the eighth inning with Cincinnati up three runs and Pittsburgh’s 3-4-5 hitters coming up. Unlike Hader, Iglesias ran out of gas after 1.1 innings and couldn’t seal the deal. This is the risk with taking the high-leverage types, Hader included. They are going to miss out on some saves if they allow a couple of baserunners and reach their designated pitch count limits. After removing Iglesias, David Bell played the mix and match game. Amir Garrett came in to face Adam Frazier, with David Hernandez following right-hander Pablo Reyes. Hernandez walked Reyes, and engaged in an epic battle with Corey Dickerson which resulted in a game-ending groundout. Iglesias is still the reliever to own, but be prepared for several more games like this as the season progresses. Jose Alvarado is going to start out as the Rays’ closer and Diego Castillo is not a threat for now. Castillo entered in the sixth inning of Tampa’s 4-2 Friday win against Houston. Manager Kevin Cash had the perfect opportunity to use Alvarado in a high-leverage situation in the eighth inning. Lefty Michael Brantley came to the plate as the tying run. Instead of bringing in Alvarado, Cash opted for Adam Kolarek. In fact, the same exact scenario played out again on Saturday, and Cash employed the same strategy once more. Opting to save Alvarado to begin the ninth inning is a solid sign for investors. That “traditional” usage signifies to me that Cash wants Alvarado to succeed as his closer. Now it is up to the young left-hander to deliver. Jordan Hicks did not get a save in St. Louis’ Friday night victory in Milwaukee, but his owners should be happy with how things played out. Andrew Miller was brought in to start the eighth inning, and allowed a home run to reigning MVP Christian Yelich. Hicks then started the ninth and quickly disposed of the Brew Crew, striking out two of three batters faced. He looks to be the favorite for saves in the early going and can solidify his standing with a few more dominant outings. A funny thing happened on the way to Trevor May and Blake Parker battling it out for saves in Minnesota. That thing’s name is Taylor Rogers. Rogers came into face Greg Allen with two outs in the eighth inning of the Twins’ opener. Allen represented the tying run, and Rogers struck him out to end the inning. Job done, right? Time to bring in someone to pitch the ninth and close this one out… except Rogers stayed in the game. Not only did he stay in the game, but he retired the Tribe in order, picking up two additional strikeouts on the way. For the skeptics out there, Rogers’ outing was no fluke. Rogers incorporated a slider at the expense of a middling sinker last season, while also tweaking the arm action on his curveball. Once Rogers made those adjustments, he was lights out. In August and September of 2018, Rogers faced 85 hitters. Of the 85, 28 struck out. Only 13 of them reached base. None of them scored. Rogers was perhaps the most dominant reliever in all of baseball during the last two months of the season. Despite this, May and Parker were thought to be the lead dogs in the fight for saves, with Rogers remaining in a setup role. And that may still be the case for all we know. Saturday’s events did not do much to clarify things. May began the seventh inning but only faced two hitters. Rogers pitched a scoreless eighth. Parker pitched the ninth but gave up the winning run and took the loss. Personally, I want to see it again from Rogers before I fully buy in and spend a bunch of FAAB or use a move in leagues with transaction limits. But if Rogers is given the chance to close out games consistently, he can put up some elite numbers. Brad Boxberger got a save for Kansas City on Thursday, but the usage itself felt odd for a would-be closer. Kansas City entered the ninth with a 5-0 lead and turned to Wily Peralta to open the final frame. Peralta allowed two of three hitters to reach base and quickly gave way to Jake Diekman. Diekman walked Yonder Alonso, which created an official save opportunity. But Diekman (a left-hander) was allowed to face right-handed hitting Eloy Jimenez with the bases loaded. Diekman hit Jimenez, then induced a force out from Daniel Palka. With Tim Anderson approaching the dish, Ned Yost brought in Kevin McCarthy instead of Boxberger. But McCarthy was not up to the task, giving up a hit and a walk. It was only then that Yost brought Boxberger in to finish the game. If Thursday’s usage was bad, Saturday’s was worse. Boxberger pitched the seventh inning of Kansas City’s 8-6 victory and it was not pretty. Boxberger allowed three runs in the outing and is likely on the outside looking in. Ian Kennedy pitched the ninth for his first career save. I have no idea if Yost plans to use Kennedy, Diekman, or McCarthy in the role, but Boxberger looks to be on the outside looking in for the moment. Owners will likely need to look elsewhere. David Robertson did not factor into the decision in Philadelphia’s 10-4 victory against Atlanta on Thursday, but his usage also raised some eyebrows. He began the eighth inning with Atlanta bringing their big boppers coming to the plate. But Philly was ahead by seven runs at the time. It’s not like the game was in the balance at that point. Gabe Kapler loves to tinker and having Robertson come in with the heart of Atlanta’s order may signify a preference for the veteran in high-leverage situations. Robertson did pitch the ninth on Saturday. However, he allowed two runs in his frame, while Seranthony Dominguez tossed a scoreless eighth. Robertson owners may have to sweat this situation out for quite a while. The Orioles had a rare lead heading into the eighth inning on Saturday. Mychal Givens struck out the side in a scoreless eighth. However, he then gave way to soft-tossing southpaw Richard Bleier in the ninth. Bleier nearly blew the game before Mike Wright had to rescue him and earn the save. New manager Brandon Hyde also used an opener in this game. If Hyde is going to use Givens in high-leverage situations, Givens’ value drops even further than it already was. I can still envision a scenario where Raisel Iglesias pitches in those situations but still approaches 30 saves on an improved Reds’ club. Baltimore is probably the worst team in the league. Givens can ill afford to lose saves because of this strategy. Drew Steckenrider pitched the eighth inning in Miami’s Friday night loss, with Sergio Romo following in the ninth. The usage boded well for the veteran, but the performance did not. Romo gave up four earned runs in just one-third of an inning. The Marlins do not figure to generate a ton of save chances as it is, so outings like these are doubly tough to swallow. Sure enough, Romo was brought in to finish the seventh inning on Saturday, with Steckenrider cruising through a clean ninth inning. This is likely a situation to avoid going forward, but Steckenrider may have jumped ahead of Romo for the moment in this competition.